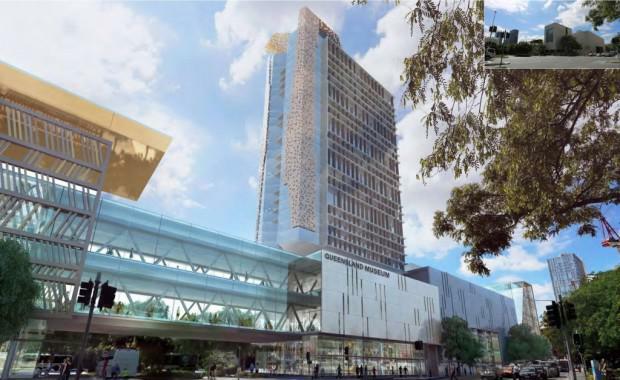 THE cultural precinct at Brisbane's South Bank has been listed on Queensland's heritage register, putting an end to plans for two residential towers in the area. The decision by the Queensland Heritage Council will protect the original cultural and civic buildings from inappropriate future development including 30-storey towers to be built above the Queensland Performing Arts Centre and the Queensland Museum under plans supported by the former Newman Government. The Australian Institute of Architects had lodged an application in 2014 to protect the cultural centre, attracting a record 1,254 public submissions. The new listing includes the Queensland Art Gallery, Queensland Museum, (QPAC) and The Edge at the State Library of Queensland. ALSO SEE: South Bank Culture Centre: Development Progress Vs Preserving Icon? The original buildings were designed by architect Robin Gibson and built in four stages between 1976 and 1988. The Minister for Environment and Heritage Protection Dr Steven Miles said the Cultural Precinct was a much loved public asset attracting millions of visitors every year. “These buildings, widely recognised as a unique part of Brisbane’s skyline, are some of the most celebrated works of the late architect Robin Gibson,” Dr Miles said. “The listing ensures any changes to the Precinct remain true to the spirit of its original design. “The Australian Institute of Architects’ nomination of the Queensland Cultural Centre attracted a record 1254 public submissions—the most received by the Queensland Heritage Council for a single nomination in the history of the Heritage Act. “The Queensland Heritage Act protects our state’s diverse heritage places. These places have aesthetic, architectural, historical, scientific, social values that are important to the community,” he said. Today’s listing excludes the original State Library, which was re-developed, along with the Gallery of Modern Art which opened in 2006. Deputy Premier and Member for South Brisbane, Jackie Trad supported the listing and said the Brisbane Cultural Precinct clearly demonstrated historical, aesthetic and cultural significance. The Cultural Precinct Master Plan, an initiative of the former LNP Government, will now be reviewed. Arts Queensland will commission a Conservation Management Plan to inform future planning and investment in the area.